Enter the World of Harry Potter. Your ticket to Universal Studios is a portkey into the storybook world of JK Rowling. WTF is a portkey? A portkey is an ordinary object that has been charmed to transport anyone who touches it to another place. This portkey takes transports you to two very unique experiences at Universal Studios and Universal Studios Islands of Adventure. The day my family and I went to Universal Studios, it rained a bit and to my surprise the park was empty. We actually walked pass the entrance to Diagon Alley, when we finally found it we realized this was where everyone ventured to! Universal Studios goes all out when it comes to attention to detail! Diagon Alley is the perfect example! It was created to transport fans into the Harry Potter world of books and movies. A few highlights of "must see" places are the "Knight Bus", "Hogwarts Express" and "King's Cross Station", "Ollivander's", and "Gringott's Money Exchange"
To get to Hogsmade we had to board the Hogwarts Express, I loved that they made the waiting experience interactive, the wait didn't seem long at all! 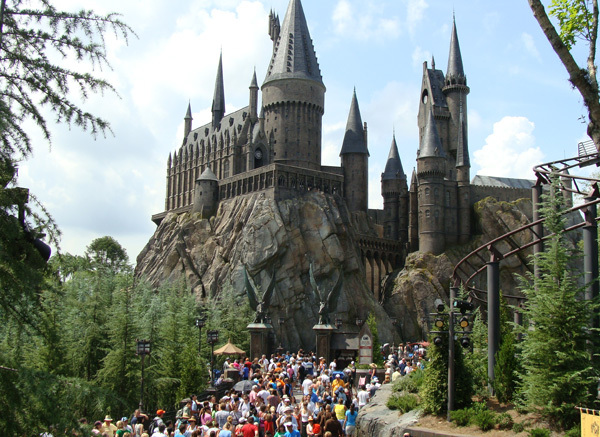 The tour of Hogwarts castle is what MAKES Hogsmeade in addition to the tour there is a ride as well. It was in between a mini roller coaster and an interactive ride, so much fun! Dumbledore's office, during the tour of this, Harry, Ron, and Hermonie are in Harry's invisibility cloak. It was pretty rad hearing those characters again! The infamous sorting hat. At PotterCon I got sorted into Hufflepuff, on Pottermore I got sorted into Slytherin... I'm all kinds of confused lmao! If you are in Florida or California you have to make The Wizard World of Harry Potter a thing to do. Don't worry about not knowing the world, learn as you go and have fun!